Save up to 30% on farm diesel bill by blending natural gas into intake air. C&E Clean Energy Solutions is marketing add-on kits for stationary diesel engines that make it possible to blend less-costly natural gas into the fuel mix and save money on diesel fuel. Brian Carpenter, the "C" in C&E Clean Energy Solutions, says by running a diesel on a blend of 50% to 70% natural gas, the diesel fuel bill can be reduced by 30%. "The engine is started on diesel fuel and brought up to operating temperature, then the natural gas supply is turned on. Our kit draws natural gas directly from the pipeline that feeds it through a nozzle into the engine's intake system based on the engine's manifold vacuum. Blending natural gas into the intake air stream of a stationary diesel engine is a simple and money-saving possibility with Clean Energy Solution's new fueling kit. 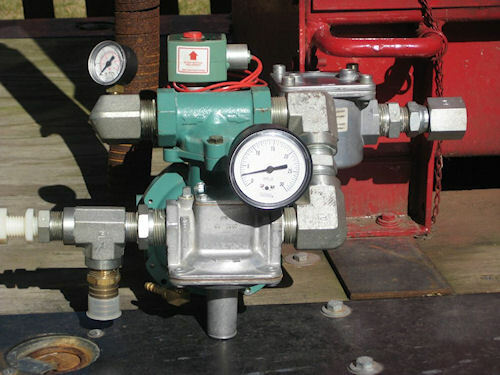 "Because compression heat alone is not enough to reliably ignite natural gas, a reduced amount of diesel is injected at the top of the compression stroke to complete the ignition and combustion of the air/natural gas/diesel mixture. The engine's governor automatically meters the diesel fuel at a dramatically reduced rate," he explains. The kits work on both naturally-aspirated and turbo-charged engines, and allow the operator to run the engine on straight diesel or a diesel/natural gas blend to take advantage of any fluctuations in fuel prices. Installation includes drilling a small hole in the air intake manifold and another in the air filter box, plus patching two wires into the electrical system to control the gas flow solenoid. C&E Clean Energy Solutions, Sturgis, So. Dak., offers kits sized for engine horsepower and hourly fuel consumption. For more information on the kits, contact C&E at (308) 339-0896, or email: info@cecleanenergy.net.